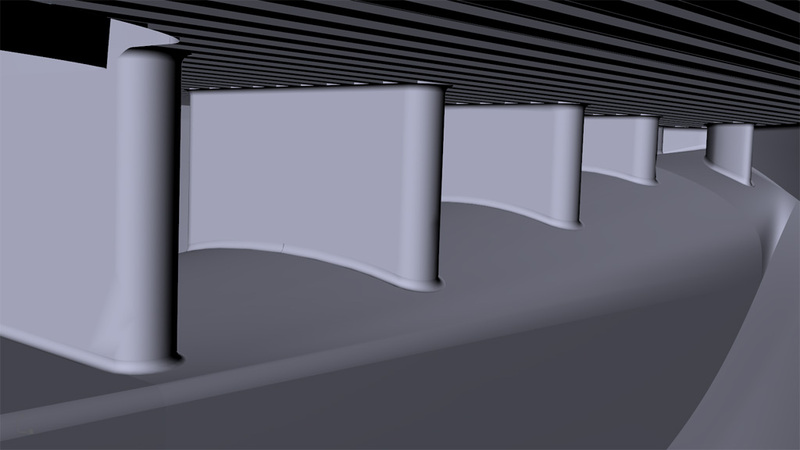 The Wavewalk® Series 4 incorporates a number of design innovations, including the way its bow is bridged by a structure that can serve as a stand up casting platform. The S4 bow structure features a pair of molded-in carry handles in its front tip, and four molded-in vertical walls that support the platform on which the angler stands. At the right end of the image, we can perceive the inside of the tip of the bow, with one of the molded-in carry handles. From there and looking to the left, we can see the four vertical walls that support the top of the stand-up casting platform. When standing next to the boat and looking over the bow, these walls’ top parts look like elongated pits (as seen in the video). The vertical wall that’s the closest to the cockpit’s front end serves as support to a wooden (MDO) wall that’s not seen here. This wooden wall is the top part of a structural element whose lower part is a front saddle bracket. The wooden wall’s top end is inserted into the coaming (spray deflector), and it is attached to the molded-in wall by means of extra-long aluminum rivets. Thus, the wooden wall adds its own support to the stand-up casting platform. The top surface of the bow’s standing platform features grooves, and the above image shows these grooves as they would look to someone who was in the front end of the cockpit and peeked inside the right hull at the bow. Readers who are familiar with the W700 saddle’s round ‘holes’, which are molded-in support columns for the saddle’s top, will recognize this function in the elongated ‘walls’ at the bow of the S4. First, Happy New Year to you and your family. When will you have the first one ready for your test ride? I can’t wait to see a video of the S4 in action. Happy New Year to you and everyone you care about! The tooling (cast aluminum rotational mold) for the S4 is projected to be ready for production by the end of March. Realistically speaking, based on our experience with previous projects, we’re talking early April.